Comments: Single cam on the floor. 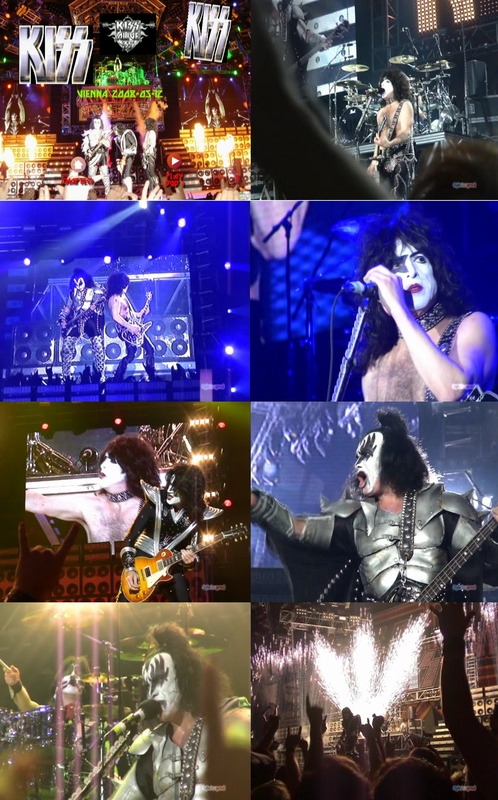 Plenty of heads in the way and the position of the filmer has this looking almost like the Paul Stanley solo show. Picture quality is decent, a little blurry and shaky, and lacking in color. Audio is muffled and slightly distorted at times. Comments: 2 DVD, SylvAce. Single cam on the balcony stage left. Well-shot as usual, just a bit shaky here and there. Partially shot on screen. Excellent picture quality, just a bit blurry on closeups. Audio is from at least two sources but is, according to the DVD credits, courtsey of Arcossi. Overall it’s OK, although it has a certain mp3 feel to it in the highs, but there are a few dips in quality and a few clicks and pops. Original audio isn’t included. Stills between songs, which seems to be a recurring feature on these SylvAce DVDs, are a little annoying to me. Comments: 2 DVD. 2-cam: one fairly high on the balcony a but right of center, the other a little lower on the balcony a bit left of center. Very well-shot and with excellent picture quality. The 2-cam mix is good, just a bit too much picture-on-picture for my taste (see screenshots for an example). Audio is good but unfortunately distorts a little when the whole band is playing. The encores have a different source for the audio which is less distorted but muffled in the highs instead. Gene’s comment before 100,000 years is classic. Comments: 2 DVD, SylvAce. Single cam on the “floor” just about center stage. fairly well-shot, a bit shaky and with the unavoidable obstructions from shooting at that level. Partially shot on screen. Excellent picture quality. Audio is awesome but does reveal that Paul has an off night. The most interesting part of the show is that the audience sings along to the guitar solo in Detroit Rock City.